Black holes are extremely dangerous objects in space .They begin when a super nova collapses and if the collapsed star is three time more dense than the original star it creates a black hole. There are two sizes of black holes large and small but scientist are saying that there could be a medium sized black hole. 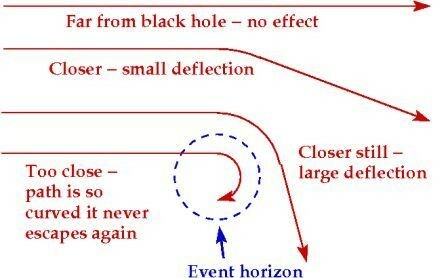 If you come across a black hole you will be able to tell because anything behind the black hole will be distorted. Once you enter a black hole there is no going back, the part of the black hole where this happens is called the event horizon (which is the ring around the black hole). 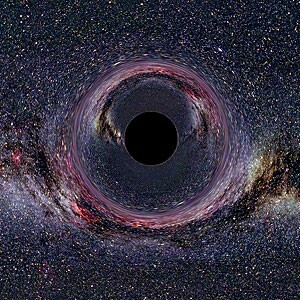 The gravitational pull of a black hole is so strong that not even light can escape. If a human was to enter a black hole it would mold that persons body into a toothpaste like form. These strange objects are found in all kinds of places in space this is what also makes these things very dangerous. Another fact about black holes is that one day there might be a possibility that a black hole might be able to destroy Earth. this is what it looks like when you come across a black hole it distorts the images behind it. Black holes can be found any where in the universe. Any where you find a collapsing super nova there is the possibility of there being a black hole. There have been many theories of the locations of black holes one big theory is that there is a black hole in the center of our galaxy. Can a black hole destroy our planet ? Yes it is possible of a black hole being able to destroy earth , but it is very unlikely because we have no knowledge of super novas in our galaxy, but there is always a possibility for a super nova to form then to collapse extremely early. If a black hole was ever to consume the earth there would be absolutely no chance of escaping once you pass the event horizon. Thankfully we have never been close to a black hole and hopefully we never do, but remember there is always the possibility that we might.